For a city its size and despite being ranked 153rd out of 210 television markets by Nielsen Media Research, Bangor is fortunate to have a wide variety of media outlets in the area. The city is home to sseven television stations that represent NBC, CBS, ABC, Fox, PBS, CW, and Pax. More than 15 radio stations' signals penetrate the area. The city is also served by two newspapers and a regional magazine. Bangor Daily News. With a daily circulation of about 56,000 and a weekend circulation of about 63,000, the Bangor Daily News covers events in central and northern Maine and is published Monday through Saturday. The paper, established in 1889, is one of the few remaining family owned papers in the country. The Maine Edge. 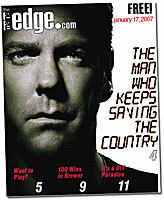 A free alternative newspaper targeting 18- to 44-year-olds, The Maine Edge debuted in convenience stores and on local street corners in December 2006. The paper comes out every Wednesday and has a circulation of 17,000 copies that are now available at more than 1,000 locations. Readers can also read the print edition and archives online, as well as check in daily for news updates. The Weekly. As its name implies, The Weekly is a weekly newspaper that covers Penobscot County. 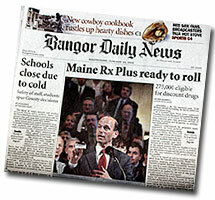 The Bangor Daily News took the paper over after a subsidiary publisher decided to discontinue publication. Coverage features a calendar of events, news releases from nonprofit organizations, short writeups on news that didn't make the Bangor Daily News's City edition and health and welfare features. Bangor Metro. 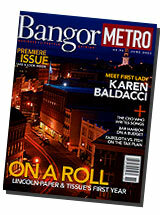 Bangor Metro began publishing in May 2005. The magazine, which has a circulation of 12,000, features stories that focus on the region's lifestyle and business climates. Channel 2, WLBZ: WLBZ is central and northern Maine's NBC affiliate. The station is a member of the Gannett Co. Its sister station, WCSH, is based in Portland. Some of the station's syndicated programs include "Dr. Phil," "Rachael Ray," "Family Feud," "Inside Edition," "Judge Alex," "Rebecca's Garden." WLBZ offers weekday newscasts at 5 a.m., noon, 5 p.m., 5:30 p.m., 6 p.m., and 11 p.m. The 5 a.m., noon, 5:30 p.m., 11 p.m. and weekend reports originate from WCSH in Portland. Channel 5, WABI: A CBS affiliate, WABI is Maine’s oldest television station. It broadcasts University of Maine football, men’s and women’s basketball, and men’s ice hockey. The station’s syndicated programs include “Cold Case,” “That ’70s Show,” Ellen DeGeneres, Oprah, Montel Williams, “Everybody Loves Raymond,” “Family Guy,” “King of the Hill,” “Extra,” “Two And A Half Men,” “CSI: Miami.” The station has weekday newscasts at 4:55 a.m., noon, 5 p.m., 6 p.m. and 11 p.m. Weekend newscasts are at 6 p.m. and 11 p.m.
Channel 7, WVII: WVII is an ABC affiliate and only one of two stations in central and northern Maine that broadcast in stereo (WMEB is the other) in analog. The station's syndicated programs include "Friends," "Judge Judy," "Live With Regis & Kelly," "Wheel of Fortune," "Jeopardy," "24," "Seinfeld," "Ebert & Roeper," "This Old House," "Star Trek: Enterprise." WVII has newscasts at 6 p.m. and 11 p.m weekdays. It does not have a local weekend newscast. Channel 12, WMEB:A member of the Maine Public Broadcasting Co., WMEB is central Maine's PBS affiliate. The station broadcasts in stereo in analog and produces several local programs in conjunction with its MPBC partners. In the morning, the station uses its second audio program to broadcast the Bangor Daily News for people with vision problems. At other times of the day, the station uses its SAP signal to broadcast the National Weather Service. "Quest" is a weekly program devoted to educating Mainers about their state's scientific identity. "Made in Maine" is a weekly program that visits Maine businesses and teaches viewers what is made in Maine and how it's made. Lou McNally is the host. "Maine Watch" takes an in-depth look at current events in Maine news. In February and March, the station broadcasts the Eastern Maine high school boys and girls basketball tournaments beginning with the semifinals. Channel 22, WFVX: WFVX is Bangor's Fox affiliate. It is owned by WVII's parent company and features a 10 p.m. daily newscast produced by WVII. The station's syndicated programs include "The Simpsons," "Malcolm in the Middle," "Seinfeld," "Entertainment Tonight." Channel 33, WBGR: WBGR is an affiliate of the Pax network, which broadcasts original and syndicated programs such as "Diagnosis Murder" and "Eight Is Enough." Local news produced by WABI airs weekdays at noon and 10 p.m. The CW affiliate is available to viewers with digital television receivers and those whose cable television provider is carrying it. The station is not available to viewers with analog receivers. Time Warner: Time Warner provides cable television service to Bangor and most of its surrounding communities. Its basic package includes all of Bangor's local stations and Boston's UPN affiliate, WSBK. Other channels included in basic service are: FOX, FOX Sports, SportsChannel New England, New England Sports Network, CNBC, ESPN, ESPN2, American Movie Classics, CNN, CNN Headline News, Nickelodeon, MTV, USA, TNT, Weather Channel, Bravo, A&E, CMT, TNN, Prevue, Discovery Channel, Sci Fi Channel, Comedy Central, Learning Channel, History Channel, Lifetime, Family Channel, Home Shopping Club, C-SPAN, and Faith & Values Channel. Whether you're into rock, pop, or classical music -- or even talk and sports radio -- you'll find a Bangor radio station that will satisfy your listening tastes. Here's a list of area radio stations and their formats.